June seemed to fly by although I only had Sandonista to compete I had lots of holiday and schooling liveries in to keep me busy! With Detonator off for a 2nd month I hadn’t really planned to get Sando qualified for advanced medium regionals but having done so well with the first couple and gaining quite a few points towards regionals I thought with very little time left I would try for the rest. I decided to give a trip to Bramham Horse Trials a miss and take him to Northallerton, all I needed was 65% which he had been getting no problem, but this was the last competition I could really take him to before the cut off date of the 17th. There was only the one advanced medium class so it all hung on this test, so obviously Mr Super-Consistent Sando decided he really just wasn’t feeling it that day and came out unusually unsettled and tense. 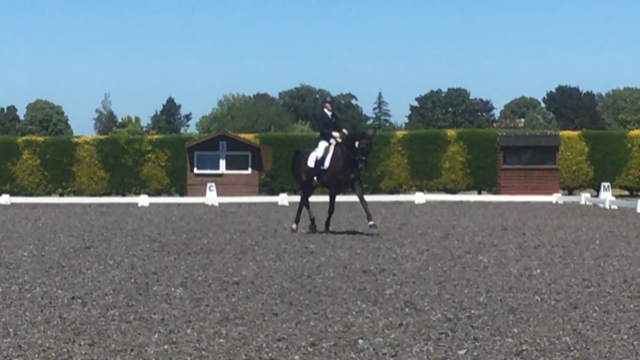 No matter how much I tried in the warm up to settle him and get him focused he was just having none of it, resulting in an unusually inattentive test and too many mistakes and our lowest advanced medium score of 63%! So a mad panic to find somewhere fairly local in the remaining 5 days meant cancelling lessons and a trip to Manor Grange instead of being careful, it’s such a fine line but and I hope I can ride like that all the time one day! Because I missed all the Premier Leagues with Detonator, I thought seeing as Sheepgate were holding Nationals Direct Adv Med qualifiers I would take Sando there. It would be a good experience for him and nice for me to catch up with people. With a 4.15 am start we headed down to Lincolnshire and had a lovely 2 days. He was nervous for the first day but still held his own against horses that are doing PSG level finishing just outside the top 10 with winter regional points. The 2nd day he was much better in his first teat gaining a 68% and 6th place in a big class. 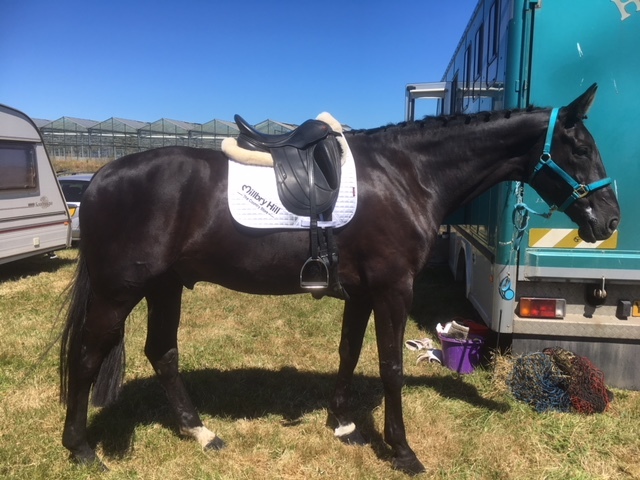 He was a bit tired for the qualifier class but with 2 mistakes still got a 65% and finished mid way against some hot competition, I was thrilled with him and he will have learnt a lot from it. Mario is still on rehab but hopefully I’ll sit on him again in a couple of weeks. Detonator is healing well but we are playing it safe and just walking him for another month, there is no rush as we have missed all the big shows now and I would rather he is fully right to hopefully get our Grand Prix test in before the end of the year. 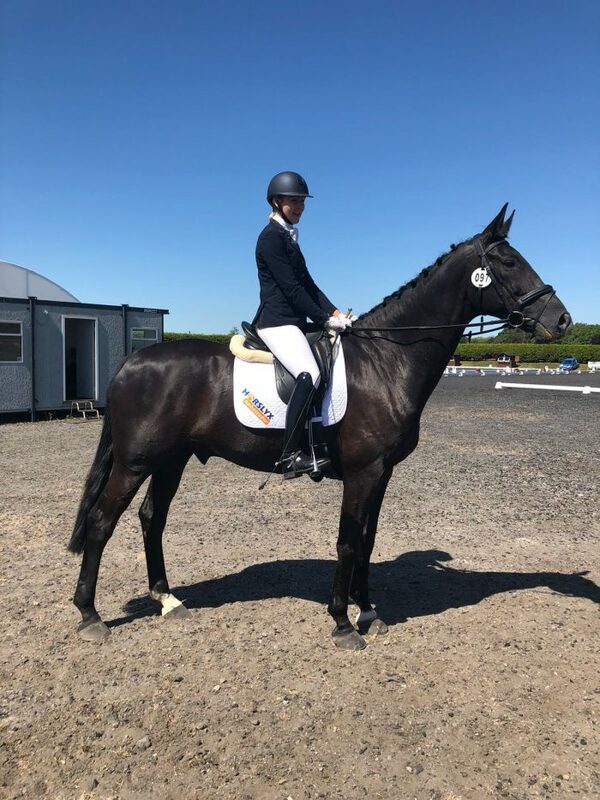 We had our HORSLYX unaffiliated dressage championships at Beckside Livery Stables, the competition was very close up to the last day. Our champions were finally crowned, Junior intro and prelim Bethany Thompson, Intro Linda Winspear, Prelim Alice Smith, PYO class Katherine Rayment, really well done to you all and a massive thank you to HORSLYX for the amazing prizes! Detonator is extremely thankful for his Horslyx keeping him entertained while he is stabled more. We are also inundated with flies and horseflies at the moment so its great to have the Garlic Balancer licks out in the fields with them. July is regionals time with Sando but I stupidly came off my road bike last weekend dislocating my shoulder, so I’m having to be very careful but I will make it there!